Hold your horses, did Aquila tip stall on landing? I might have been a little hasty with my go Team Somerset praise of Facebook’s Internet drone Aquila. Yet to be confirmed reports from the Yuma test site tell us that Aquila crashed at short finals. We know the registration of at least three of the craft as they were revealed by the FAA aircraft register in 2015. N566AQ and N567AQ both show up at Yuma on Flightradar24 but neither has a flight track. I was hoping to see if either did land short. 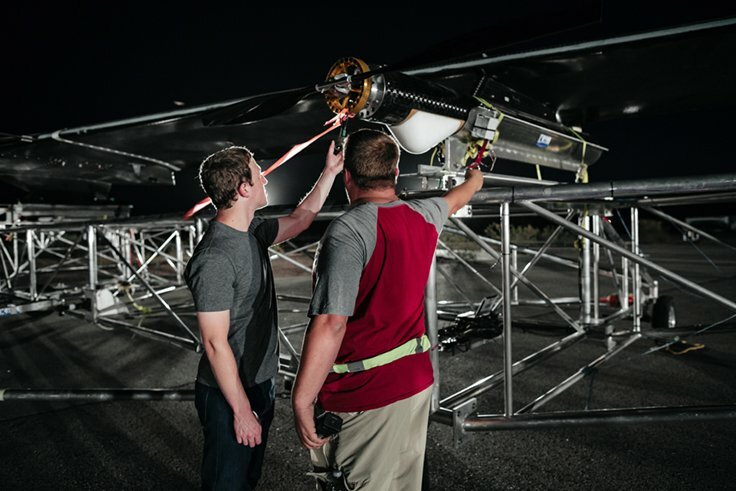 Facebookers responsible for the project, Martin Luis Gomez and Andrew Cox blog about the flight and mention the take off…..
Takeoff: Aquila’s design is optimized for minimal mass, so it does not include traditional takeoff and landing gear. The first part of our test involved orchestrating a new kind of takeoff. We attached the airplane to a dolly structure using four straps, then accelerated the dolly to takeoff speed. Once the autopilot sensed that the plane had reached the right speed, the straps were cut simultaneously by pyrotechnic cable cutters known as “squibs.” While the ground-based crew can command the plane’s heading, altitude, airspeed, and GPS-based route from a control computer, there are no joysticks involved — takeoff is on autopilot. A great deal of simulation and analysis were performed prior to first flight to understand the dynamics of takeoff and to choose the aircraft’s pitch on the dolly, the speed at which it would be released, and the initial elevon angle. The specifications based on our simulations resulted in a successful takeoff. How to we hear from Yuma?? Patrick has worked there…..
Why not ask us for a free consultation on your next project?